I adore criticism, and I rarely enjoy reading more than when I’m digging into great profile writing. But I also find straight-up oral history fascinating, especially when the person doing the talking is a musician. The feeling of candid nightclub conversation is more palpable than when the dialogue is being filtered through a features writer. If that scribe is as perceptive and erudite as, say, JT’s Matthew Kassel, who writes about the bassist Thomas Morgan, then fantastic. If not, I’d often rather comb through Q&As. This bass-themed issue is chock-full of musicians simply telling stories and sharing thoughts: Ron Carter recalling the classic Freddie Hubbard session where Rudy Van Gelder and Lenny White butted heads over an “oil-can bass drum”; Anne Mette Iversen explaining what she learned when she transcribed Carter’s basslines; Christian McBride remembering when Boyz II Men alum Michael McCary helped him avoid a beatdown; and Bill Laswell, taking no prisoners during his Before & After listening exercise. Among his targets is one of his important collaborators, Herbie Hancock, and while I wholly respect Bill—an original pressing of Baselines is sitting on my desk, no lie—I feel compelled to defend the pianist, especially in light of a recent evening at L.A.’s Walt Disney Concert Hall. 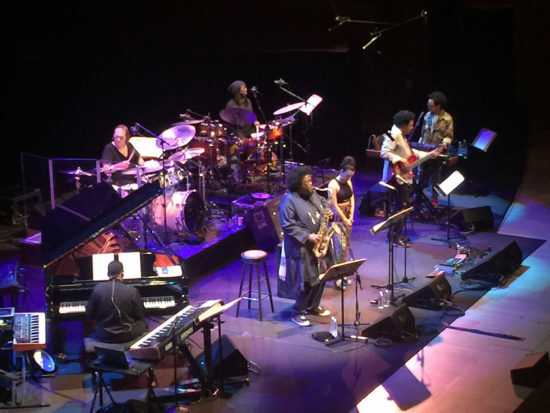 It was by far the best Hancock show I’ve seen, and one of the most immersive large-scale, theater-sized jazz concerts I can recall. Hancock, an irrepressibly sweet presence, is fond of waxing spiritual and sentimental about his art in a way that can come off like lip service. The thing is, he actually delivers on his lofty ideals. At Disney he led a cross-generational working group—saxophonist and keyboardist Terrace Martin, bassist James Genus, drummer Vinnie Colaiuta, guest flutist/vocalist Elena Pinderhughes—through music that was fusion-like in its sonics but pure Miles-rooted postbop in its ability to morph and surprise. The program was sharp, balancing engaging new work with refracted renditions of the greatest hits, but the chemistry was the thing—at once loose and unshakable, and giving the audience the sensation of eavesdropping. When Kamasi Washington unexpectedly turned up, blending into the groovy din and blowing Pharoah-like on “Chameleon” and more, I became my own worst enemy and went for my smartphone. I couldn’t help myself; the night felt too much like jazz history, like living through a musician’s tale.